Dr. Clayton Lawrence, CEO and President of LEAP, LLC, took a moment to thank supporters after being named the 2015 Washington D.C. Chamber of Commerce’s Small Business Person of the Year. 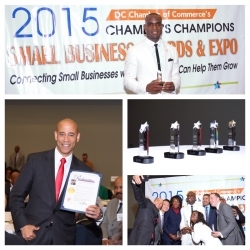 Washington, DC, June 08, 2015 --(PR.com)-- After receiving the award for being selected as the 2015 Washington D.C. Chamber of Commerce’s Small Business Person of the Year, Dr. Clayton Lawrence took the opportunity to thank his closest supporters, the Chamber, and the Washington D.C. community. Though Dr. Lawrence and LEAP have been no strangers to recognition throughout the business world, he spoke about how humbled he was to receive such a prestigious honor and the dedication that he will continue to show as a business leader in the greater D.C. area. To learn more about Dr. Lawrence and LEAP, LLC, and LEAP Foundation DC please visit www.leap4staffing.com and www.leapfoundationdc.org.